The Mormon Trail was America’s greatest trek of the 19th century. 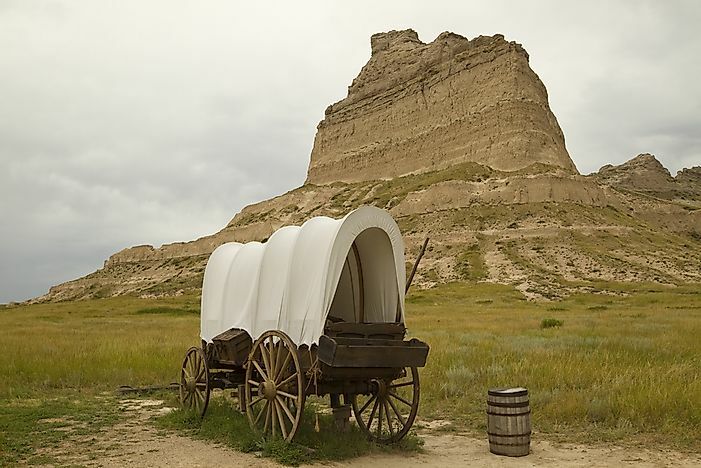 Scotts Bluff was an important landmark on the Mormon Trail. There had been few earlier attempts by Europeans to venture out into the continental United States from the comforts of the East Coast, as these regions were thought to be dangerous. Native Indians were believed to present a grave danger to anyone who dared move into their territory. The harsh climate, characterized by soaring temperatures, and many new diseases were also a significant hindrance preventing any European expeditions into the heart of the United States. A breakthrough came when Brigham Young and his small group of Mormons began a dangerous trek, one which would take them 1,300 miles westwards into the young nation’s interior. This dangerous trek would later come to be known as the Mormon Trail, America’s greatest trek of the 19th century. Where Is the Mormon Trail? The Mormon Trail covers about 1,300 miles from its starting point Nauvoo, Illinois, to its end in Salt Lake City, Utah. The trail passes through the states of Utah, Nebraska, Illinois, and Wyoming. After the first Mormons started the original trek in 1846, it would be used for trade and transport for about 20 years before the construction of the First Transcontinental Railroad in 1869. The Mormon Trail commenced in 1846 after Brigham Young, a natural leader of the Church of Jesus Christ of Latter-day Saints, convinced a small group of fellow believers to engage in a journey westwards into uncharted regions of the United States after they were expelled from their traditional home in Nauvoo. With their belief in their faith being their primary motivation, this original group of Mormons grew to an estimated 2,000 trekkers in the first year of the trek. The travelers would establish settlements along the way, some of which like Salt Lake City would eventually grow to become major American cities. The Independence Rock is arguably the Mormon Trail’s most famous and most distinctive landmark. What makes the Independence Rock so special are numerous inscriptions engraved on its surface, which were made by the early Mormons who are believed to have marked their arrival to this immense geological feature with much celebration while marking their names on the rock. Another landmark found along the Mormon Trail is the Sweetwater River. The river was of great importance to the arriving Mormons during their trek, as it provided the much need water for drinking as well as for watering their animals. The banks of the river, rich in pasture offered an excellent grazing ground for the thousands of livestock. Thousands of tourists flood the trail each year, some aiming to reenact the historic trek while others just to catch a glimpse of the dozens of essential sites that dot along the trail’s entire stretch. Not to mention followers of the Latter-Day Saints faith who troop to the Mormon Trail in their thousands due to its religious significance to their Mormon denomination. Currently, the Mormon trail has formed part of the National Trails of the US and they are referred to as the Mormon Pioneer National Historic Trail. The Mormon Trail is perhaps the American trek of most historical significance, as it resulted in the opening up of continental United States. Major cities in America attribute their origin to this 19th-century trek, such as Salt Lake City. The bravery of the thousands of Mormons who took up the challenging trek enabled traders to follow suit, and in so doing accelerating the development of regions of the United States that were initially thought to be inaccessible.